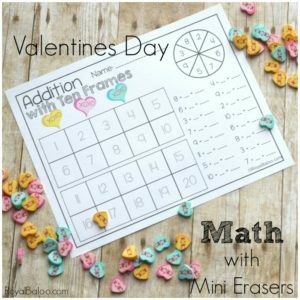 This valentines mini eraser math combine adorable mini erasers with math fun! Practice math, play with erasers, and have a great time. My kids suffer from shiny object syndrome. As in, they can be distracted by anything even remotely shiny or interesting. I’ve found the key to harnessing that power of distraction. Intentional shiny things. Like…mini erasers. Yes! I am using the mini erasers as a distraction intentionally. They want to use the erasers and really want to play with them. I’m just providing a useful avenue for them! If you are on my mailing list – you received this in your inbox 2 days ago! If you’re not on my mailing list, well you get it right now! But if you want these things early (sometimes) in the future, be on the mailing list! I promise to be useful and not spamalicious. I have to say, I am so excited…no stoked – for this pack! When Kim at Live Over C’s started making the adorable packs with the mini erasers, I knew I needed some (erasers, that is). Her packs are amazing and adorable. But my kids are too old for them. Sad face. Long story short, I talked to Kim and decided to make a few sets for the boys! They absolutely love little trinkets like these and I couldn’t pass the opportunity. So I rushed down to my nearest Target and bought about 12 different packs of mini eraser. Tons of fun. I actually had to go to my 2nd nearest Target. Our closest one is on the small side. Thankfully we are moving closer to the big one soon. My husband thinks we are moving to be closer to family. Nope. I want the better Target. And family is an added bonus. Can’t find the erasers? I’ve heard some people are selling them on ebay but I’ve also included printable hearts! 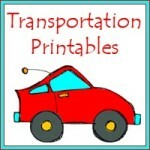 Everyone can use these pages – with or without the erasers! So what is in this Valentine mini eraser pack? There are 4 different pages that cover 4 different topics – addition with ten frames, simple fractions, nonstandard measurement, and arrays. Each one utilizes the erasers, too! On the Addition with Ten Frames page simply use a paperclip and pencil for the spinner. Determine the second number in the equation and write it on the line. Then use the erasers to add the numbers together on the 10 frame. There is another version of this page without the numbers on the ten frame. 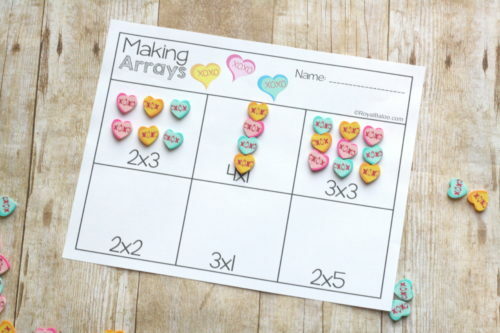 Very simple – make arrays with the erasers. The arrays should be read as “2 rows of 3” and “4 rows of 1”. The fractions are my favorite. On the top row, write in the correct numerator. On the bottom row, grab a handful of erasers and write your fraction! Rulers are obviously preferable, but nonstandard measurement can be a great place to start with measuring items. 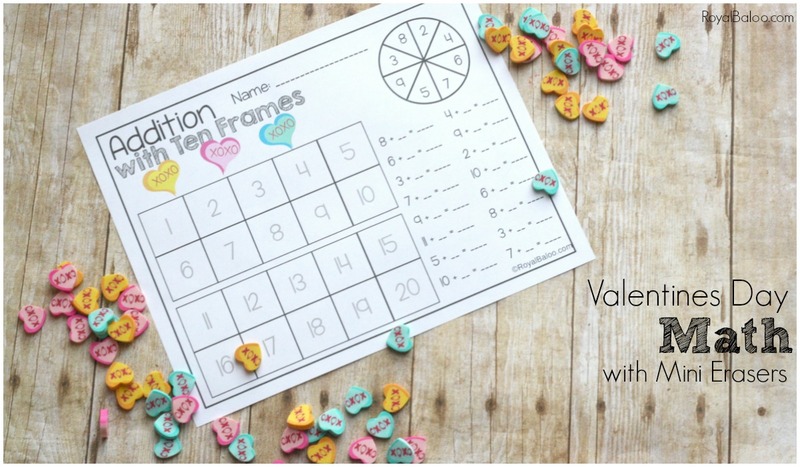 There are 4 Valentine objects on the page to measure! It doesn’t really matter how the erasers are lined up as long as they are lined up consistently.